Tag line: "Born with the courage of an eagle, the strength of a black tiger, and the power of a God"
Anyone who was a kid in the ‘80s has likely heard of director Don Coscarelli’s 1982 film, The Beastmaster, and probably even saw the movie during one of the hundreds of times it played on cable TV. With swords and action aplenty, The Beastmaster is a fantasy lover’s delight. Upon learning of the prophecy that he will die at the hands of King Zed’s (Rod Loomis) unborn son, the Sorcerer Maax (Rip Torn) arranges to have the child destroyed. His efforts fail, however, and the boy, named Dar, is taken in by a peasant (Ben Hammer), who raises him as his own son. After growing to manhood, Dar (Marc Singer), who has the ability to communicate with animals, vows revenge against Maax and his evil army, the Jun Horde, when they attack his village and kill his adopted father. Joining forces with an eagle, a black tiger and a pair of ferrets, Dar sets out for the city, where Maax has imprisoned the King and taken control of the entire area. Along the way, he falls in love with Kiri (Tanya Roberts), one of Maax’s slaves, and meets up with Tal (Josh Milrad), the king’s son, and his bodyguard Seth (John Amos). Together, they attempt to free the king and return him to the throne, all while avoiding the black magic that Maax and his minions have unleashed upon the world. I was a Marc Singer fan back in the day, having seen him in the 1982 drama If You Could See What I Hear, a biopic of blind musician Tom Sullivan, as well as the 1983 mini-series V and its 1984 follow-up, V: The Final Battle. In The Beastmaster, Singer does an adequate, if unspectacular job as Dar, but to be fair, the role wasn’t exactly a demanding one; aside from looking heroic, all it required was that he know how to run (Dar does a lot of running in this movie) and swing a sword. Also present are the stunning Tanya Roberts (who’s given even less to do than Singer) and the always enjoyable John Amos, an actor I’ve been a fan of since his stint on the ‘70s sitcom Good Times. Standing above them all, though, is Rip Torn, going way over the top as the diabolical Maax, the sorcerer with a falcon’s beak for a nose. 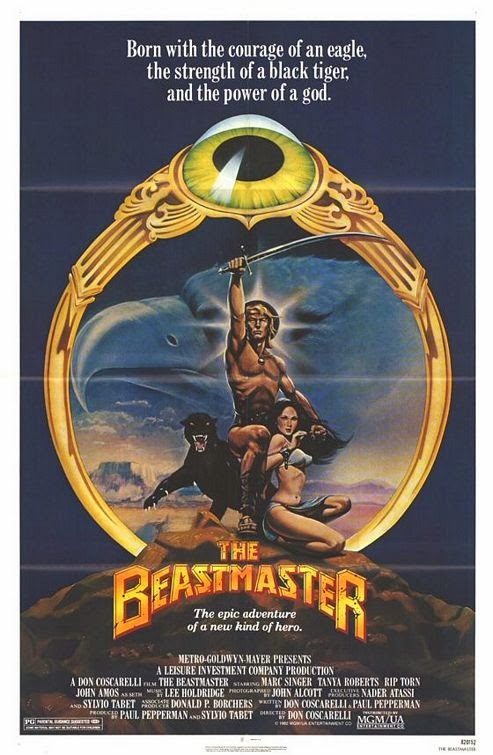 But what makes The Beastmaster so entertaining is its story, and it’s unique twist on the “good vs. evil” plotline. There are a few unusual moments (like when one of Maax’s three witches, sent to kill Zed’s unborn child, “transfers” the baby from the womb of its mother into that of a cow) and a handful of horrific sequences (as a kid, the bat-like creatures Dar encounters inside the cave scared the hell out of me), but for the most part, the film is just good, wholesome fun. Modern audiences may find The Beastmaster more comical than exciting, and will likely laugh at some of the film’s cheesier elements (of which there are plenty). But for those of us who grew up on movies like Conan the Barbarian and Clash of the Titans (the originals, mind you, not the recent, inferior remakes), The Beastmaster will always hold a special place in our hearts. I never saw it. Not even being a sword and sorcery fan could get me to the theater to watch that movie. Tanya Roberts worth the watch in an otherwise bland offering. Plus Schwing!